Tumacacori’s primary façade was originally finished in a polychromatic painted lime plaster where significant decorative finishes can still be found on the entrance, arch, columns, and moldings. Currently approximately 155 square feet of historic plaster is estimated to remain on the exterior; however, repair plasters may be obscuring a great deal more of the original fabric. Generally, the historic plasters are two to three layers thick and contain remnants of red, yellow, orange, and blue- black colored paints. Stratigraphic analysis reveals that the plaster layers consist of a rough-cast or scratch coat with a brown or intermediate coat (in some areas up to 0.25 inch thick) and a thin limewash approximately 0.5-1mm thick. Samples collected have been analyzed using cross-sectional analysis, various methods of microscopy, X-ray diffraction (XRD), scanning electron microscopy with energy-dispersive X-ray spectroscopy, Raman spectroscopy, and Fourier transform infrared spectroscopy. These various analytical methods have produced stratigraphic, topographic, molecular, and elemental information that will characterize the original and subsequent surface finishes and their current conditions. 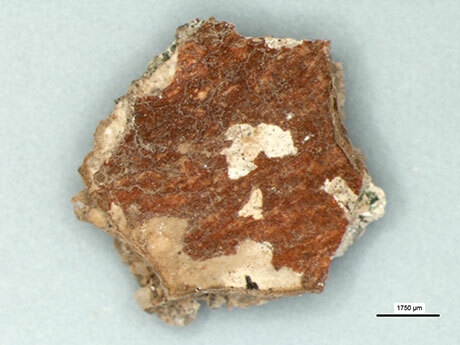 A micrograph of red painted detail showing original surviving finishes. Raman and FTIR spectroscopy were performed at the Scientific Research & Analysis Laboratory, Winterthur Museum. 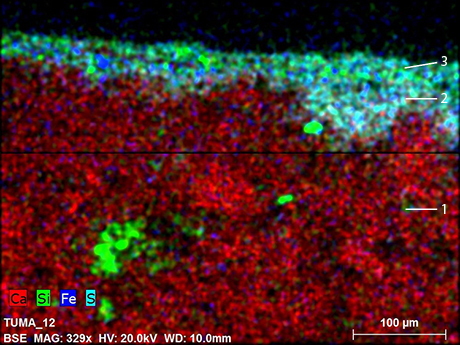 Nanoscale characterization using SEM was conducted at the Singh Center for Nanotechnology (SCN) located at the University of Pennsylvania, a member of the NSF National Nanotechnology Coordinated Infrastructure (NNCI) network. A cross-section of the red painted plaster at 100x magnification under various illumination (left - visible light; center - ultraviolet/visible light; right - ultraviolet light). Bright red pigmented finish layer (layer 3) over thin preparatory white layer (layer 2) and coarse aggregate paste substrate (layer 1). 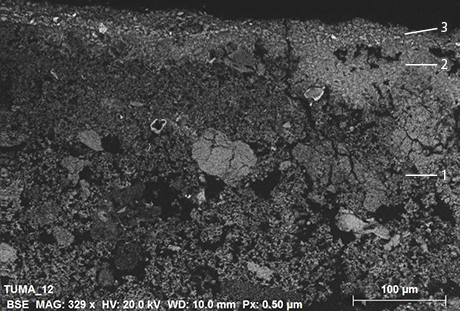 SEM-EDS backscattered image of the same sample. SEM-EDS false color elemental mapping on the same sample. 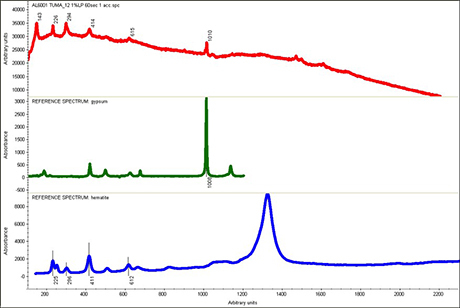 Raman spectral data showing presence of hematite and gypsum within the bright red finish layer. Plaster sample analyzed by acid digestion method. Sieve analysis of aggregate obtained after acid digestion. The interior of the church has more than 4,000 square feet of original plaster in the sanctuary and nave. The plaster consists of three distinct layers: two 1-inch thick lime plaster layers, and a thin gypsum wash. However, like other surfaces of the mission church, the interior received many different synthetic spray-on preservatives, most of them silicones, acetates, or acrylic resins. During the 1970s, plated lag bolts were also inserted at critical locations to stop failure of the plaster. Understanding the characteristics of original plaster and repair campaigns is a key to determine the treatment methodology to be used. 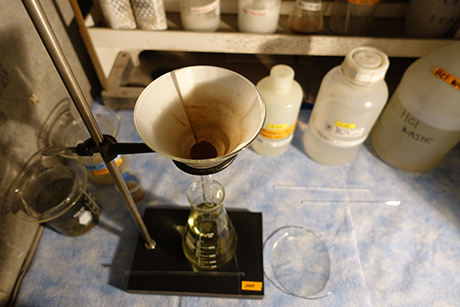 Two groups of samples (original plaster and repair campaigns) collected during field visits were analyzed in the laboratory at the University of Pennsylvania. Acid-digestion to determine ratio of aggregates and binder. 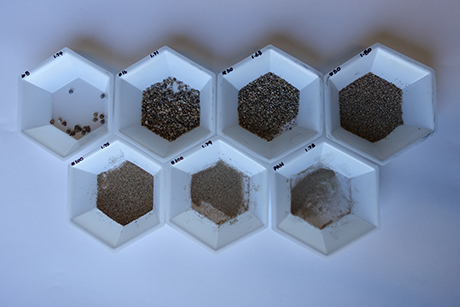 Sieve analysis to determine sorting of aggregate. Petrographic analysis to determine mineralogy. 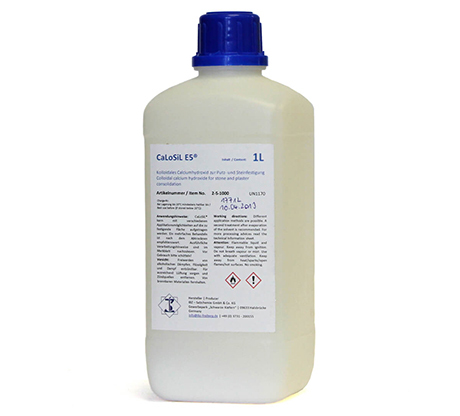 1L container of CaLoSiL E-5 product produced by IBZ‐Salzchemie GmbH & Company KG, Germany. Performance of nanolime was evaluated as a possible inorganic consolidant for friable historic lime based plaster at Mission San José de Tumacácori. Among two available commercial nanolime products, CaLoSiL® produced by IBZ‐Salzchemie GmbH & Company KG was tested as a possible treatment for friability. The testing program utilized facsimile samples representing the weathered conditions of exterior plaster of the mission church. Following ASTM and RILEM standards, the evaluation program was designed to examine the performance of nanolime based on established performance criteria well known for the consolidation of porous materials. Physical testing included splitting tensile strength, porosity using liquid nitrogen, water vapor permeability, color change, and frost resistance. All test results statistically confirmed that commercial nanolime-CaLoSiL® can provide satisfactory consolidation of friable lime plaster. Original adobe samples were analyzed using standard geotechnical analysis (Atterberg Limits) for soil characterization. Overall, the original adobe was made from a sandy loam soil with low clay to sand/silt content. It also has very low Tumacacori adobe has a plasticity index lower than 10 and a liquid limit lower than 23%, and a very low amount of organic matter. 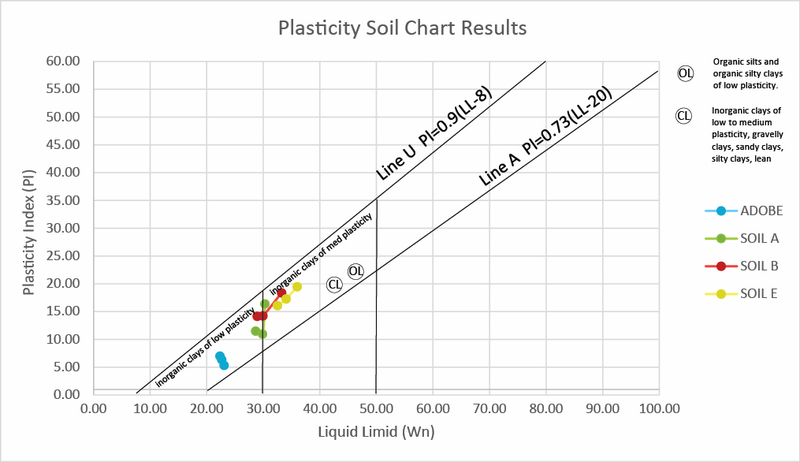 Comparison of the plasticity of soil samples to adobe sample. Soil based grouts were tested for the reattachement of interior plasters to the adobe substrate. The formula tested for the grout was 2.5 parts soil to 1 part water with 2% sodium hexametaphosphate added as deflocculating agent. Sodium Hexametaphosphate is commonly used as a method to reduce shrinkage and viscosity. As a dispersion agent, HMP prevents particles from coming out of suspension and flocculation. When added to scattered particles in suspension, there is a reduction in viscosity due to the neutralization of the forces of attraction. Three local commercial soils were tested for suitability and compatability as a soil grout. All were found to be suitable; however soil E was selected. Soil E was sieved through a #10 sieve (particles no larger than 2 mm) to produce a finer grout while reducing micro cracking due to drying shrinkage. Tests were performed based on their wet and hardened properties. These include working properties (wet grout) such as flow and viscosity, wet density, shrinkage, and expansion and bleeding; and hardened properties such as capillary water absorption, water retention, water vapor transmission permeability, and splitting tensile strength. The grout formula tested was 2.5 parts soil and 1 part 2% sodium hexametaphosphate solution. 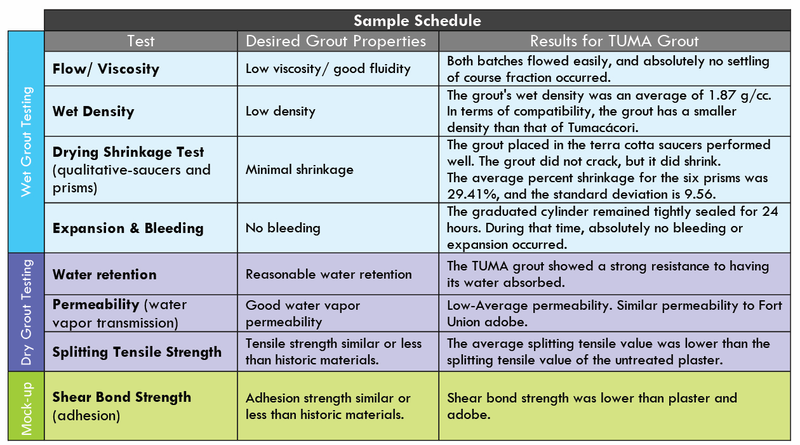 Summarized test results for grout performance.